Hardy Zones 4-10 Full to Part Sun Deer Resistant Mature Height: 30' Immediate shipping in 4" pot. Dormant shipping in winter. 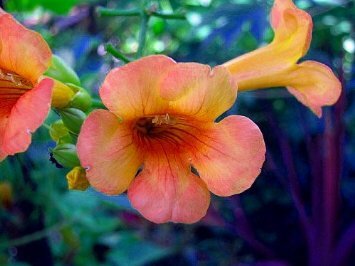 Indian Summer Trumpetvine features bold clusters of harvest gold trumpet-shaped flowers with orange overtones and scarlet throats at the ends of the stems from early summer to early fall. It has dark green foliage throughout the season. The large serrated pointy pinnately compound leaves turn yellow in fall. A deciduous climbing vine that is easy to grow and an American native. Attractive to hummingbirds, butterflies and bees, this would be a great addition to a butterfly garden. Will cling to garden structures and will grow rampantly in full sun or partial shade. Will grow in any average soil. Prune back to a few buds in the early spring, as flower buds form on new growth. Hardy Zones 4-10. Full to Part Sun. Mature Height: 30'.